The authors follow a strict methodological approach that combine in-depth textual analyses, philology, anthropological inquiries and fieldwork thereby creating a new approach within the field of Tibetan historical study. In addition and pursuant to the textual elaboration, the endeavour to identify and localize all relevant toponyms and the detailed cartographical work following it opens up a new dimension to the historical study and what might be labelled historical geography, throwing new light on the historical development and its ramifications in the hinterlands of the political and religious centres. 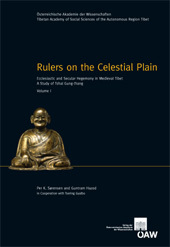 Starting from the history of the Tshal-pa - in the 13-14th century the religious and political hegemony of sKyid-shod, the core region of Northern Central Tibet - the present study offers new insight into the relations and interaction between clan, territory, religious lineages and local powers within this region around Lhasa in the period from the 11th to the 17th century. Part 1 of the book (=volume 1 of the present edition) is a translation of a basic text concerning the history of Tshal Gung-thang; the latter means the monastic centre near Lhasa (today only partly extant) which was founded by the charismatic ascetic, yogin and religious head Gung-thang Bla-ma Zhang (1123-1193). Connected to it is a very detailed annotation of the text, drawing up a host of (partly rare or unknown) comparative sources on the earlier history of this region. Part 2 includes five appendices: four lengthy individual studies on various aspects of the history (and cultic tradition) of Tshal-pa and the Lhasa valley, as well as a compilation of several historical tables. This includes clan genealogies, lists of religious institutions, lists of names, such as the numerous teachers and disciples of the Tshal-pa founder, religious lines of neighbouring monastic powers and not least genealogical tables of the regional hegemonies of the post Tshal-pa era. An extensive cartographical and photographical documentation (including rare historical photos) as well as the facsimile of two Tshal-pa texts complete the present work, which may be regarded as a source book or reference work on the history of sKyid-shod and the Lhasa Valley, the politically most important area in Tibet. Easy access and reference is ensured through an index which includes all personal names and place names mentioned in the two volumes.